Figure 2. Front (left) and side (center) exterior and interior (right) views of South American whistle figurine. Interior image shows partially blocked air passage. During the past year, the MicroCT Imaging Consortium for Research and Outreach (MICRO) was established at the University of Arkansas to provide the scientific community with access to state-of-the-art micro computed tomography (micro CT or µCT) technology. The MICRO lab is built around a Nikon XT H 225 ST system (Figure 1), acquired with grant funds provided by the National Science Foundation. Led by Professor Claire Terhune (Anthropology), the project co-PIs are George Sabo (Arkansas Archeological Survey) and Wenchao Zhou (Mechanical Engineering) from the University of Arkansas and Professors Paul Gignac and Haley O’Brien (Anatomy and Cell Biology) from Oklahoma State University Center for Health Sciences. Figure 1. 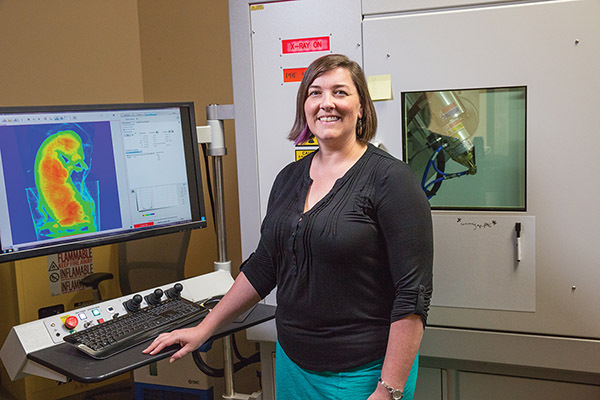 Dr. Claire Terhune (UA Anthropology Department) stands at the MicroCT console. MicroCT imaging uses x-ray technology to produce high-resolution two- and three-dimensional renderings of the external surface and internal structure of a wide range of objects, including archeological, biological, engineered material, geological, paleontological, and other kinds of specimens. 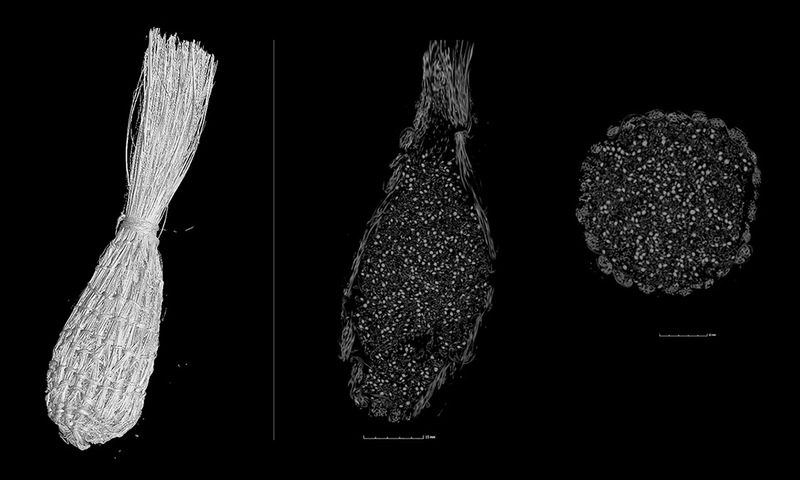 The Nikon system we acquired is capable of producing image resolutions to micro (1–100 microns) and nano scales (<1 micron) for objects no larger than 21 cm in diameter and 50 cm in height, and weighing up to 50 kg. Target items are positioned on a rotating stage within the shielded microCT chamber. The specimen is then automatically rotated for a series (typically, several thousands) of x-rays that produce a set of 2D images produced in a TIFF format. The resulting set of images, representing internal variations in density and referred to as a “TIFF stack” is then read into a computer program that uses mathematical algorithms to generate a 3D representation. Other computer programs can then be used to analyze the 3D model and produce various kinds of visualizations customized to specific research needs. More information on the lab and the process is available on the MICRO project website. MicroCT imaging offers great potential for archeological investigations. Applications include examinations of surfaces bearing written text on ancient desiccated scrolls that cannot be unrolled, study of the internal structure of ancient animal and plant remains retrieved from archeological contexts, and investigations of the internal structure of a wide variety of artifacts including ceramics, basketry, and woven fabrics. Though we are just beginning to examine archeological specimens from Arkansas, some interesting results have been acquired from our initial experiments. Arkansas Archeological Society member Jim Rees has been studying musical instruments preserved in archeological contexts for several years, and in his examination of specimens in the University of Arkansas Curation Facility at the Survey’s Coordinating Office, he discovered an ancient South American ceramic figurine that produced a distinctive whistling tone when blown through the orifice protruding from the back of the figurine’s head. We scanned the object to find out if the interior contained any special air chambers or other means to divert the flow of air. Imaging of the interior produced using visualization software revealed a partially blocked portion of the upper orifice just behind the head (Figure2). Figure 3. External (left), interior side (center), and interior top-down (right) views of modern replica seed bag. The interior images show Chenopodium seeds and woven rattlesnake master bag structure. Elizabeth T. Horton, research station archeologist at Toltec Mounds State Park and the Survey’s paleoethnobotany specialist, has long been interested in a small bag of ancient plant seeds retrieved from 1932 University of Arkansas Museum excavations at Edens Bluff Shelter in Benton County, Arkansas. Woven of rattlesnake master fibers, the bag contains nearly a liter of domesticated Chenopodium berlandieri seeds, along with an undetermined amount of Rudbeckia seeds (sunflower family) radiocarbon dated to ca. AD 20. MicroCt scans of this specimen will produce the first comprehensive view of the bag’s contents, an opportunity not otherwise possible without great risk to the artifact’s integrity. Given the necessity of producing a successful scan on a first attempt, in an effort to minimize trips from the artifact’s safe and secure home location to the MICRO lab (across campus) and back, Dr. Horton produced a smaller facsimile version—woven of rattlesnake master fibers and filled with wild Chenopodium seeds—for test scanning. The results, shown in Figure 3, suggest exceptional promise. For a quick technological comparison, Figure 4 illustrates a standard x-ray image of a ceramic animal effigy head with a rattle inside from the Knappenberger site in northeast Arkansas. You can read more about this artifact in Field Notes No. 368. We’ll provide further updates as additional artifact scans are produced and analyzed. * This article appeared first in Field Notes, Newsletter of the Arkansas Archeological Society, No. 405 (November/December), 2018, pp. 11–13. Figure 4a–b. Photograph and x-ray image made in 2012 of ceramic animal effigy from the Knappenberger site.